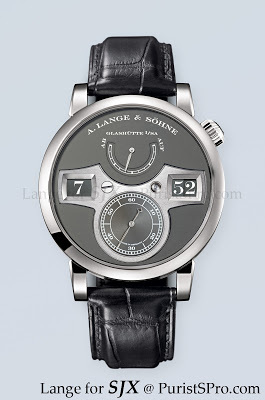 On 27 Aug 2011, a piece unique Lange Zeitwerk – in white gold with grey dial and engraved “1/1 SGP 2011” – will be auctioned with all proceeds going to the Kidz Horizon charity in Singapore. It was contributed by the family of the late Duncan Wang, a prominent watch collector based in Singapore. Kidz Horizon benefits children with chronic illnesses whose parents cannot afford treatment. In addition to the grey dial and white gold case – no other Zeitwerk has a grey dial – this watch is also distinguished by the engraving on the back. According to the organisers: “This piece being offered here is even more special. Designated as a pièce unique with the inscription “1/1” on the case back, together with the commemorative phrase, “SGP 2011”, this watch is unique indeed. These two inscriptions are highly unusual for A. Lange & Söhne. The company rarely takes special requests for limited editions, and almost never with the inscription indicating that it is a pièce unique, or with the name of a city and year. The special exception was made by Lange CEO Wilhelm Schmid, as recognition to the late Duncan Wang as a special collector and a friend of the brand.” The Wang family also issued a statement for this event: “We would like to express our deep appreciation to A. Lange & Söhne, for honoring the memory of our son Duncan in such a generous and exceptional way this year. There were few things he enjoyed more than a good meal in the company of good friends, especially when it included some discussion of fine watches. And if, in the process, he could make life easier for those less fortunate than he, that would be even better. A. Lange & Söhne is to make a unique version of their LANGE ZEITWERK in white gold with a grey dial for this year’s Kidz Horizon Appeal Charity Ball in Singapore, a first for the brand in Asia. 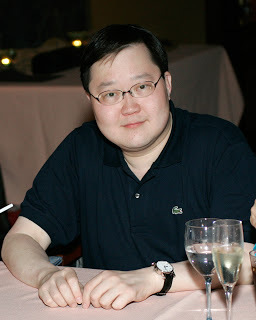 In August 2009, Duncan Wang, an Ameri­can Chinese businessman and watch col­lector passed away at the age of 44 years. His parents and his friends in Singapore found a fitting way to remember him, based on the two things that he was most passionate about – watches and charities. One year later, the first “Duncan Watch” was auctioned off for a children’s charity in Singapore: The Kidz Horizon Appeal. Formed in 2004, and helmed by Dr Caro­line Low-Heah, it raises funds for children suf­fering from chronic diseases such as cancer or AIDS HIV whose parents are not in a position to afford the medical treatment they need. As both Dr Low-Heah and Duncan Wang have always been great admirers of A. Lange & Söhne, it stood to reason that a special edition Lange timepiece would sooner or later be the Duncan Watch of the year. This year, a one-of-a-kind LANGE ZEITWERK in white gold with a grey dial and a special engraving will be auctioned at this year’s costume charity ball for The Kidz Horizon Appeal to be held at the Ritz Carlton Ball­room, Singapore, on 27 August 2011. When Lange CEO Wilhelm Schmid was asked to contribute a special edition Lange watch for the Kidz Horizon Appeal Charity Auction he and his team were immediately thrilled because they felt it was the right thing to do: “To care for the society we live in, and in particular for the young, is deeply rooted in the history and values of our brand.” The Lange manufactory was established in the first place to fight unemployment among young people in a destitute area. 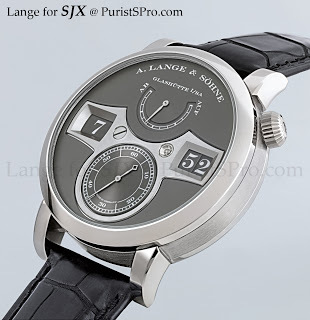 Unlike hardly any other watch the LANGE ZEIT­WERK stands for uncompro­mising clarity. Featuring indications of a size so far considered to be beyond feasibility, its dial always provides an unambi­guous reading of the current time. With a soft click and no perceptible delay, the display advances from one minute to the next within fractions of a second. And at the top of the hour, the watch performs the big leap, when all three numerals discs jump forward by precisely one increment at the same time. The switching power is generated by a constant-force escapement between the mainspring barrel and the balance. Concur­rently, it makes sure that the flow of power to the balance remains constant throughout the entire power-reserve period. The design of this unique version, showcasing dark/bright contrasts, is emphasised by a white gold case, grey dial and numeral discs with white numerals, a black crocodile strap, and the folding clasp, also crafted from solid white gold. 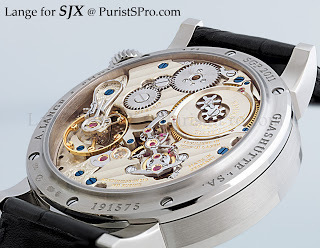 A special engraving on its caseback bears witness of its uniqueness and the occasion: “1/1 SGP 2011″.